Also known as The Fox Hunter’s, The Fox Hunters’, The Foxhunt, The Foxhunter’s Jig, The Foxhunter, The Foxhunters’, The Foxhunters, Nead A Lachan Sa Mhuta, Nead Na Lachain, Nead Na Lachain ‘Sna Luachra, Nead Na Lachain Sa Luachair, Nead Na Lachan. There are 85 recordings of a tune by this name. A tune by this name has been recorded together with Comb Your Hair And Curl It (lots of times), The Drops Of Brandy (a few times), The Kid On The Mountain (a few times), The Boys Of Ballisodare (a few times) and James Kelly’s (a few times). The Foxhunter’s has been added to 75 tune sets. The Foxhunter's has been added to 1,141 tunebooks. # Added by Netallica 17 years ago . # Added by JesseW 12 years ago . # Added by ThePants 11 years ago . # Added by Freespirit 3 weeks ago . # Posted by karas 15 years ago . Can be heard as part of the set entitled "The Foxhunt" on Chieftains 2, side 1 track 6. It is played straight after "the Foxhunters jig" and is oh! so similar. They play it fast and not at normal mazurka speed but then again it is part of one of the Chieftains renowned tone-pictures. They don’t play it at mazurka speed indeed, because it’s a slip jig. They do play it quite a lick but speeding up a tune doesn’t change it’s time signature. I checked before I posted this tune, and as far as I could tell, it was not in the database. It is not in the same meter as the Foxhunter’s Jig (already in the database), so I posted it separately, using the mazurka meter. 5. "FAST MAZURKA": Flute, with other instruments playing sound effects. Eventually all instruments are playing the fast mazurka. The slip jig and mazurka versions in this set sound completely different to me in that the first is in the common 9/8 meter and the latter is in a mazurka 3/4 meter. That’s why I posted this as a separate tune. On fast slip jigs, see the comment from blarneystar regarding Tommy Hunt’s Jig (https://thesession.org/tunes/2579). I’m still unclear how a fast slip jig played in a meter of 3/4 (1-2 1-2 1-2) should be notated in 9/8 (1-2-3 1-2-3 1-2-3). And I’m particularly interested in what to do in the case of this jig, which (as I mentioned before) is not simply a speeded-up version of The Foxhunter’s Jig already in the database. OK, I’m up for the challenge. Here is ABC notation for the "fast slip jig" version of The Foxhunter’s in 9/8 meter. It "looks" odd to me — I don’t think I’ve seen such a beast in O’Neill’s (for example) — but I think it parses fine. I wonder, though, whether many users of this Web site would be able to read it "correctly" as readily as the 3/4 version I originally posted. So where do I go to claim the Ph.D.? May I suggest that you listen to some Donegal music and find out what Mazurkas sound like. Also try listening to something other than the Chieftains. What gives you the impression that I have not listened to Donegal music? What gives you the impression that I do not know what muzurkas sound like? What gives you the impression that I have not listened to something other than the Chieftains? I’ve learnt this together with Deirdre’s Fancy. # Posted by JesseW 12 years ago . That’s a more standard setting than the original submission. Submitted on February 18th 2007 by Joe CSS. "Nothing to do with the reel of the same name (as far as I know). The 3rd part is exactly the same as the 1st, but with double the frequency for each note. The 2nd & 4th parts seem to do a nice E-minory thing with the c-naturals, which I quite like." Here’s the version that appears as Nead Na Lachan Sa Mhuta in Geraldine Cotter’s Traditional Irish Tin Whistle Tutor. # Posted by ThePants 11 years ago . Lunasa records this tune in G major on their album Redwood— track 7, "Dublin to Dingle," second tune. It’s clearly in a 3/4 time signature, and again with only two parts (plus the usual Lunasa variations) instead of the 4 sections that the slip jig has. # Posted by robin hood 11 years ago . ‘s déanfaidh sí steampaí ‘gus tae dhuit. 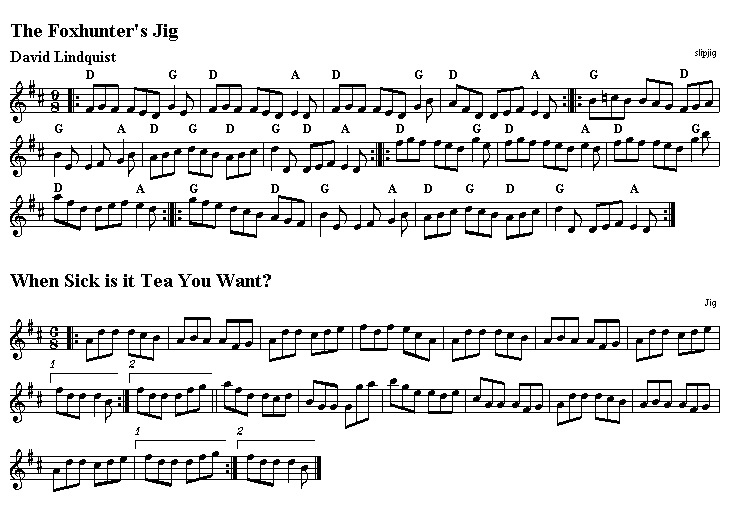 S: The Fiddler’s Tune-Book; Slip Jigs & Waltzes; p.6, No.22. I like the insistance on F in the first part, and on B and E in the second, that can be interpreted/played as the rhythmic barking and yelping of the dogs. The Mazurca form makes it even more striking. This fine slip jig is most commonly known, I believe, as the Humours of Derrycrossane. There are three settings and a video under that title. # Posted by Robert Engelman 4 years ago . @karas I find for fiddle if you do a roll/cut on some notes it varies it a bit. I also do slurring on some parts. I mainly use them on crotchet-quaver sections, e.g. FGF FDF G_E. I would slur from the G to the E note. # Posted by Siobhán Wray 3 years ago . It’s nice to see some suggested chords in a couple of settings. They seem a little busy. In D, try AGAG, BmEmBmEm,GAGA,DEmF#mGA. Using the IV and V chords give a spacey feel and turning it over for the third part brings it life in a different way. # Posted by Jeaneve 2 years ago . # Posted by Freespirit 3 weeks ago .